Rich, tropical tamanu oil is wonderfully healing to skin and makes a great hot oil treament for hair. Tamanu oil soothes and softens skin while it works to reduce foot and body odor. Tamanu oil is the traditional oil used by Polynesian women for promoting healthy, clear, blemish-free skin. Facial oil treatments with tamanu could help clear acne and fade acne scars in those who have a dry, chapped facial skin type, however it is a bit too heavy for those with sensitive facial skin. Hawaiian Tamanu nut oil hydrates dry skin and has anti-inflammatory properties that reduce the swelling of rashes, insect bites, and sunburns. Tamanu oil also possesses significant antimicrobial, antibacterial, and anti-fungal qualities. These healing properties make it effective on scabies, ringworm, and athletes foot, and jock itch. It is also used on babies to prevent diaper rash and skin eruptions. The rich, nutty scent makes the oil pleasant to use and even helps eliminate body and foot odors. Tamanu reaches its full healing potential when applied to serious skin conditions such as psoriasis, eczema, and diabetic sores. 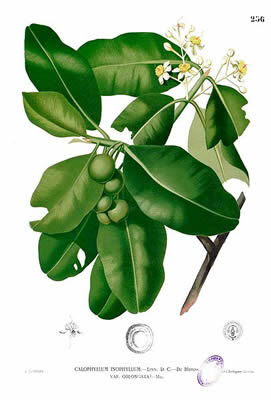 Tamanu oil is widely used in Pacific island folk medicine for healing other ailments beyond its uses in skin care. Fiji natives use Tamanu oil for joint pains caused by arthritis and gout. The oil is also used for relieving nerve pain from sciatica or shingles. Preparation Methods & Dosage :Tamanu oil has a rich, deep scent with a bold green color. You can use the oil alone or diluted with a suitable carrier oil. The Tamanu tree is indigenous to tropical Southeast Asia; it is found in Thailand, Vietnam, Myanmar, Malaysia, South India, Sri Lanka, and the Melanesian and Polynesian islands. 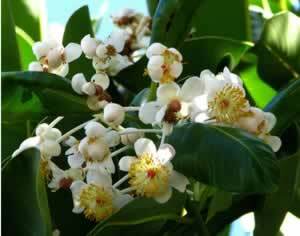 The Tamanu tree blooms twice annually with fragrant, white flowers, which later yield clusters of yellow-skinned spherical fruit nut,and from this a sticky oil is cold-pressed to make a greenish yellow oil similar to olive oil. It takes 100 kilograms of Tamanu nuts, the amount that one tree produces annually, to yield just 5 kilograms of cold pressed oil, which puts the somewhat the high cost of this spectacular nut oil into perspective. Related Species The Tahitian tamanu may also refer to the Calophyllum tacamahaca. In fact many references treat the tacamahaca as the same species as the inophyllum. Natives believed the Tamanu tree was a sacred gift of nature and that gods hid in its branches. It was their answer to skin protection from hot sun, high humidity and ocean wind.